Developers confirm all 175 of London Array's offshore wind turbines are now fully operational. The UK's wind power industry has restated its pledge to drive down the cost of energy, as it pushed the button on the last of the 175 turbines at the world's largest offshore wind farm. The London Array project, jointly owned by Dong Energy, Masdar and EON, yesterday annouced that the first 630MW phase of the project in the Thames estuary is now fully operational. "This is the final major milestone of the construction phase and the culmination of more than two years' offshore construction work which began in March 2011 with the installation of the first foundation," said London Array project director Richard Rigg. The announcement comes just six months after London Array powered up the first Siemens 3.6MW turbine at the site. The development team will now spend the next few months finalising the development, including work to bury a number of shallow array cables. "It has been a complex operation but I am delighted that the commissioning of the wind farm has now been completed on schedule, despite the worst of the winter weather," added Rigg. 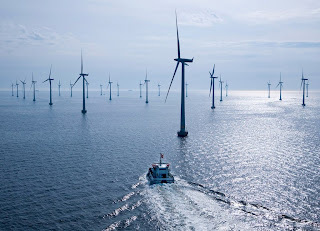 Benj Sykes, UK manager for DONG Energy's wind business, said the completion of the project was a major achievement, adding that the company was now determined to use the lessons gained from the London Array to reduce the cost of future projects. "As we now look to our pipeline of future projects, DONG Energy is determined to drive down the costs of our offshore wind farms to €100 per megawatt hour for projects we'll be sanctioning in 2020," he said. "What we have learnt at London Array, together with our continuing focus on innovation in technologies and techniques, will help us achieve that." The news was also welcomed by RenewableUK's chief executive, Maria McCaffery, who called on the government to ensure that offshore wind is adequately supported through the upcoming Energy Bill. "Britain has a real achievement to celebrate here," she said. "The largest operational offshore wind farm in the world is generating clean electricity for British homes and businesses. It's a monumental feat of green engineering. "To hold on to the UK's global lead in offshore wind, it's vital that we maintain this momentum. We must ensure that the crucial legislation going through Parliament right now - the Energy Bill - sets a rock-solid framework to encourage investment in renewables." The announcement follows the news last week that the final turbine was slotted into place at Lincs offshore wind farm on 31 March. The 270MW project will be operated and maintained from a base in Grimsby. Someone Give This Man A Nobel Prize Already. He's Going To Save The Planet!